A unique document lays bare the “depths of human misery” inflicted on Jewish people during the infamous German Pogrom which happened 80 years ago today. And now the Church of Scotland has revealed how one of their ministers compiled a dossier, exposing the “depths of human misery” inflicted on Jewish people, during the German pogrom 80 years ago today. The work contains “truthful observations and trustworthy accounts by eye witnesses” about the impact of Kristallnacht, a maelstrom of Nazi-orchestrated violence on November 9 and 10, 1938. The name refers to the broken windows of Jewish homes, businesses, hospitals, schools and synagogues which were ransacked across Germany, Austria and elsewhere. The typewritten document was compiled two months after the so-called Night of Broken Glass by Rev Donald William Mackay, who was minister of the Scots International Church in Rotterdam from 1934 to 1940. Unearthed in the World Mission Council archive at the Church of Scotland offices in Edinburgh, the document has now been made public for the first time. It contains details of the scale of the assaults carried out on the Jewish community and the preface states: “What really did happen is worse by far than anything described in these pages”. Rev Ian Alexander, CoS secretary to the World Mission Council, said: “It is extraordinary to unearth a document which shares first-hand knowledge and experience from people living through these desperate events. Mirella Yandoli, the church’s interfaith programme officer, said it remained essential to tackle the blight of antisemitism. She added: “This archive is a timely reminder, both of what happened 80 years ago and also the responsibility of the Church to act and draw attention to this hatred then and now. “Collaborating with other faiths and Interfaith Scotland on the topic of hate speech and crime in the youth or parish setting, has become a key priority. 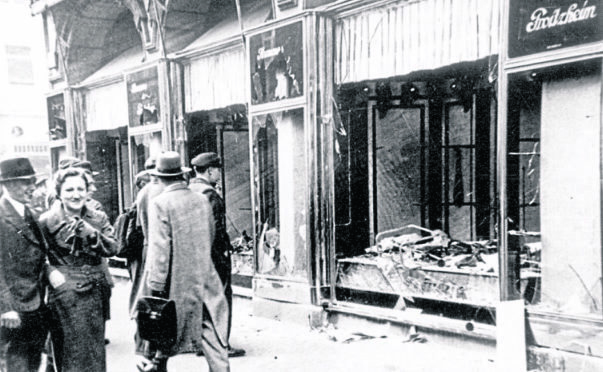 German officials claimed that Kristallnacht erupted in response to the assassination of German diplomat, Ernst von Rath, by Polish Jewish teenager Herschel Grynszpan in Paris. The purge was instigated primarily by Nazi Party officials and members of the Sturmabteilung (SA) – known as the Brownshirts – and the Hitler Youth. The following account in the newly-released Church of Scotland document, is from one Jewish businessman in Berlin. He said: “At the stroke of 3am, I was suddenly awakened. “There is a Jewish shop in the house and both its shop windows were broken and the goods destroyed. “An hour later, there was another onslaught – again a bombshell of stones upon the remnants of the window glass and that of the goods. Another account related to the treatment of elderly people. It stated: “Old and ill Jews, on complaining of stomach aches etc, are taken to the patients room in Concentration Camp X. “There, they will be forced to take one to two pints of castor oil, then they are taken into the open air and told to stand erect. A Scandinavian Christian doctor reported a violent incident in Berlin. He said: “On riding a car through Fasanenstrasse, a Jew was suddenly set upon by a gang of youths and severely beaten up. An onlooker was also attacked. A report from Austria testified to the destruction of synagogues.